Whoever said youth is wasted on the young has never experienced Azul Beach Resort The Fives Playa del Carmen, by Karisma. 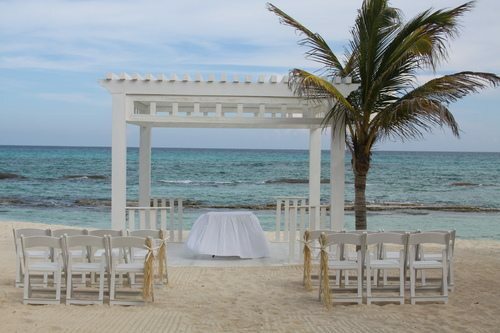 Because for tots, teens, couples, groups, honeymooners and even brides-to-be, this Gourmet Inclusive® playground will bring out the playful side in everyone. At the same time, Azul Beach Resort The Fives Playa del Carmen’ luxury accommodations and impeccable service will satisfy the most discriminating adult tastes. At The Fives Plaza, you’ll discover trendy shops, live entertainment, four restaurants and two bars. Then make your way down to Azul Beach Resort The Fives Playa del Carmen’ white-sand beach, where swim-up bars, waterfront activities and gourmet à la carte eateries satiate even the heartiest appetite for food and fun. The hotel is strategically located in Playa del Carmen on the Riviera Maya, Mexico, just 35 minutes south of Cancun International Airport. With this great location, guests can experience convenience first hand with the charming restaurants, shops, and local attractions of downtown Playa del Carmen, only 10-minutes away. The area provides many other popular attractions, including the notable selection of world class exclusive Championship 18 hole golf courses only minutes away. The 360 over-sized luxury suites at the Azul Fives Hotel are tastefully designed in contemporary architectural style. Guests will love the lush tropical gardens which frame views of both the Caribbean Sea and the hotel’s many crystal clear pools. For additional convenience all buildings at the Azul Fives Hotel are equipped with elevators. Dining at Azul Beach Resort The Fives Playa del Carmen, by Karisma, is a celebration of the culinary arts – a perfect orchestration of ingredients, preparation, presentation and service. Gourmet cuisine is the foundation for Karisma Gourmet Inclusive® Experience, and has been lauded “Superb,” “Best in class,” “Decadent” and “Outstanding.” To us it simply means creating sumptuous meals in pleasant environments prepared by the star chefs. Dining at Azul Beach Resort The Fives Playa del Carmen, by Karisma, is a celebration of the culinary arts – a perfect orchestration of ingredients, preparation, presentation and service. Gourmet cuisine is the foundation for Karisma Gourmet Inclusive® Experience, and has been lauded “Superb,” “Best in class,” “Decadent” and “Outstanding.” To us it simply means creating sumptuous meals in pleasant environments prepared by our star chefs. For Women: Sun dresses, elegant sandals, t-shirts and skirts; For Men – Long pants, formal Bermuda, polo shirt, sleeved t-shirt, sandals or tennis shoes. Permitted: Shorts, t-shirts and flip-flops ; Not Permitted: Swimming trucks, bikinis, swimsuits, tank tops, sleeveless shirts, baseball caps or any type of hat. For Women – Dresses, skirts, long pants, shoes, Capri pants, elegant sandals; For Men – Long pants, collared shirts, casuals shoes. Permitted: Shorts, sleeved t-shirts, flip flops; Not Permitted: Swimming trucks, bikinis, swimsuits, tank tops, sleeveless shirts, baseball caps. Arezzo Restaurant: With floor-to-ceiling windows, the open kitchen Italian restaurant Arezzo is a treat for the senses. An array of freshly made pastas, pizzas and grilled-to-perfection seafood, poultry and meats compose a mouthwatering menu straight out of old Italy. For wine lovers, a dedicated sommelier will help pick pairings from an impressive list of 150 varieties. Italian Cuisine. Hours: Dinner – 5:30 to 10:00 pm. Reservations required. La Brasserie Restaurant: For breakfast or dinner, Azul Fives’ contemporary Bistro Cuisine takes center stage in this old-world inspired dining establishment. Choose from the lavish Food Display or enjoy culinary classics such as Steak Tartare, Coq-au-Vin, Entrecôte au Poivre, Gratinated Onion Soup and luscious Crème Caramel. Sip on a South of France Merlot, enjoy the best cheese trolley this side of Burgundy and conclude the evening at our flambéed coffee station. Bistro Cuisine. Breakfast – 7:00 am to 10:30 am; Dinner – 6 pm to 10:30 pm. Flavours Restaurant: The name says it all. Flavours presents casual, family oriented culinary experiences from World cuisine for breakfast, Mexican Cuisine for dinner. Dine in tropical splendor beneath our glass atrium, while spider monkeys cavort outside. From our popular Food Display concept to delectable à la carte options, you’ll quickly discover why Flavours is an Azul Fives family favorite. World Cuisine. Hours: Breakfast – 6:30 am to 12:00 pm; Dinner – 5:30 pm to 10:30 pm. Gourmet Corners: Satisfying your afternoon cravings doesn’t have to be an event in itself. Sometimes you just want something to tide you over. Whether you’re in the mood for a smoothie, a sandwich or other light bites, Azul’s Gourmet Corners are the perfect way to satiate your hunger or thirst – without sacrificing your playtime in the sun. Natural, Breeze Bar N’ Burger, Lizards, La Taqueria and Palamas. Koh Thai Restaurant: A 15-foot standing Buddha greets you upon arrival, as aromas such as lemon grass, ginger and holy basil delight the senses. Sample popular classics such as Pad Thai, Green Curries and Coconut Soup, or savor one of our contemporary wok creations prepared by genuine Thai chefs. For outdoor dining, try one of our wooden pagodas floating over our lit Koi pond. Wok Cuisine. Reservations required. Hours: Dinner – 6:00 pm to 10:30 pm. Reservations required. Meso Tapas Restaurant: Extending from Mexico to Northern Costa Rica, Mesoamerica holds some of the most diverse and creative culinary history on earth. Welcome to Meso Tapas. This intimate, vibrant and cozy nook of Azul Fives dishes out the best Latin American cuisine, from street favorites to complex pre-Hispanic preparations. Arepas, Tamales, Gallo Pinto, creative “Tacos” and fantastic sweets await you at Meso. Mesoamerican Cuisine. Hours: Dinner – 5:30 pm to 10:00 pm. Oka Sushi Bar: For the finest and freshest sushi, sashimi and tempura in Riviera Maya, look no further than Oka sushi. Our talented team of Sushi Chefs will delight and entice you with their culinary mastery and artful presentations. Try a late night Junmai Sake or an ice-cold Sapporo on the balcony, as you savor the notion that this is just one night of many. Japanese Cuisine. Hours: Dinner – 6:00 pm to 10:30 pm. Oriola Beach Club Grill: Enjoy relaxed beachfront dining on a breezy outdoor veranda, with endless ocean views. Awaken your senses and delight your palate with a variety of fresh salads, made-to-order ceviches, The Taco Truck’s tantalizing tacos, signature burgers, sandwiches, ice cream specialties and pizzas galore. Hours: Lunch – 12:00 pm to 5:00 pm. Sea Olive Restaurant: Take the French Riviera, add a fondness for coastal cuisine, include a dash of Mediterranean and Mexican flair, and you have all the makings of Sea Olive at Azul Fives. Our à la carte menu features fresh, authentic Mediterranean and Mexican fusion cuisine designed to satisfy even the most discerning tastes. Dine indoors or al fresco on the outdoor terrace, where spectacular ocean views are the coup de grâce. Cuisine du Soleil. Hours: Lunch – 12:00 pm to 3:30 pm. and dinner 5 pm to 10 pm. Breeze Swim-Up Bar: Order your favorite drink and soak up the sun while enjoying a signature cocktail, mixed tropical fruit juice or refreshing smoothie. Hours: 10 am to 6 pm. The Gin Bar: From classic gin & tonics to handcrafted cocktails, our sophisticated Gin Bar pours a variety of premium gins from around the world. Upscale and stylish, it’s a great place to unwind with friends and family during your stay, or enjoy a nightcap on our grand terrace under a star-filled sky. Hours: 5:00 pm to 1:00 Adults only. Nineteen Ten Bar: Even Pancho Villa would be pleased with our authentic Mexican Cantina, Nineteen Ten. Choose from a wide selection of local and international beers, as well some of the best Tequila and Mezcal in Mexico. And don’t miss the opportunity to sing along to traditional Mexican folk songs in our weekly Mariachi appearances. Mexican Cantina. Hours 5 pm to 11 pm. Poolside Grill & Mestizos Bar: Located in the new Essence section, The Poolside Grill offers a wide range of grilled fare including an impressive array of Gourmet burgers. Overlooking the nearby pool and mangroves, this fresh, bright, open-air restaurant is the perfect place to enjoy a casual lunch or grab a quick signature drink at the bar without straying too far from your favorite pool chair. Gourmet Lunch. Hours: 12 pm to 5 pm. Zky Bar: The name says it all. Zky Bar is the perfect place to spend a night out and enjoy cocktails under the stars. Take the all-glass elevator to the second floor, where this sophisticated bar and lounge boasts a chic outdoor terrace where you can take in the views of the Caribbean and Cozumel in the distance. Watch sports on the flat screen TV’s or enjoy listening to lounge music every night of the week. Hours: 5:30 pm to 1:00 am. Whether you’re young or just young at heart, you’ll feel right at home at Azul Beach Resort The Fives Playa del Carmen. Discerning guests will appreciate our oversized Resort Residence with separate living and sleeping areas, rich mahogany-hued woods, marble finishes and luxuries such as plush robes, rainfall showers, spa robes, private balconies and complete baby amenities. From lavish 1-, 2- or 3-bedroom Resort Residence to spectacular Penthouse Resort Residence, you’ll enjoy everything from aromatherapy and pillow menus to personal concierges and 24-hour room service. 1 Bedroom Penthouse Resort Residence: Experience the height of luxury with their exclusive 1 Bedroom Penthouse Resort Residence. This Penthouse Residence take extravagance to an entirely new level. Penthouse Resort Residences are located on the top floors of each building and feature a private rooftop lounge designed for ultimate relaxation, privacy and sophisticated entertaining. This rooftop lounge doubles the living space of the 1 Bedroom Resort Residence, and offers an “al fresco” hangout with a half bathroom, patio dining area, pergola, built-in barbecue grill, Jacuzzi®, chaise lounges and a relaxing Bali bed. Inside, the 1 Bedroom Penthouse Resort Residence boasts a separate living room with modern furnishings, double-size pull-out sofa bed, modern kitchen complete with full size refrigerator, microwave, oven and stove, and dining table for four (4). The private master bedroom is furnished with a king-size bed, his & hers sinks with backlit frosted glass tops, a walk-in rainfall shower, a private toilet cabin, essential and premium bath amenities such as a hair dryer, deluxe bathrobes and a magnifying vanity mirror. Max occupancy: 2 adults + 2 teens. Size: 990 sq. ft. (92 m2). 2 and 3 Resort Residences: Experience the height of luxury with their exclusive 2 and 3 Bedroom Resort Residences. Created with the most discerning guests in mind, these spacious suites take elegance to a new level. These residences have been specially designed for families and friends, providing the same amenities as a 1 Bedroom Resort Residence, as well as tastefully designed second, king-size bed bedroom connected by an entry hall. The 3 Bedroom Resort Residence has been designed with family or friends gatherings in mind. These residences offer all of the amenities of a 2 Bedroom Resort Residence with the addition of a third bedroom furnished with two double size beds and the same amenities of the second bedroom. The three bedrooms have one connecting room and/or are joined by an entry hall. Max occupancy 2 Bedroom: 4 adults + 2 teens; 2 Bedroom Size: 1,140 sq. ft. (106 m2); Max occupancy 3 Bedroom: 6 adults + 2 teens; 3 Bedroom Size: 1,540 sq. ft. (143 m2). 2 Bedroom Penthouse Resort Residence: The 2 Bedroom Resort Residence is the perfect accommodation for a large family or group traveling together. This residence boasts a separate living room with modern furnishings, double-size pull-out sofa bed, modern kitchen complete with full size refrigerator, microwave, oven and stove, and dining table. The private master bedroom is furnished with a king-size bed, his & hers sinks with backlit frosted glass tops, a walk-in rainfall shower, a private toilet cabin, essential and premium bath amenities such as a hair dryer, deluxe bathrobes and a magnifying vanity mirror. The second bedroom is furnished with a king-size bed or double beds, and has a private bathroom. Each 2 Bedroom Resort Residence also features an outdoor terrace or balcony off the living room and bedroom with a garden or pool view. These suites are connected by an entry hall. Max occupancy: 4 adults + 2 children; Size: 1,140 sq. ft. (159 m2). 3 Bedroom Penthouse Resort Residence: This spectacular 2,248 square feet 3 Bedroom Penthouse Resort Residence takes contemporary elegance to whole new heights. Created with the most discerning travelers in mind, this accommodation is the ideal choice for groups who truly crave it all. With lavish amenities and all the indoor features of the 3 Bedroom Resort Residence, this Penthouse Resort Residence also features a private rooftop lounge designed for tranquil moments and entertaining in style. Doubling the size of living space, your rooftop provides a chic ‘al fresco’ lifestyle including a half bathroom, patio dining area with a table for six, a pergola, barbeque grill, whirlpool tub for six, chaise lounges and a canopied daybed. Plus, your personal Majordomo can arrange every detail of your stay, from private dinners prepared by a personal chef, to making reservations or scheduling activities. Max occupancy 3 Bedroom: 6 adults + 2 teens; 3 Bedroom Size: 2,248 sq. ft. (209 m2). Kids aren’t the only ones who dig Gourmet Inclusive® Azul Beach Resort The Fives Playa del Carmen. Because between the Azulitos Playhouse, My Gym programs, Azulitos Spa, Karisma Gourmet Inclusive® baby amenities and Extreme Breeze Teens Club, there’s always something fun on the menu. You can build castles in the sand. Take a cooking class. Make a piñata. Break a piñata. Try kid’s yoga. Or enjoy a just-for-kids spa treatment. And when the sun goes down, the curtain goes up, with live shows and movie nights complete with dinner and popcorn.